Why do we live in a society that, having ruined its natural environment, is now about to knowingly ruin its social environment and the lives of an entire generation? In his book Collapse: How Societies Choose to Fail or Succeed, Jared Diamond specified the causes that encourage elites to destroy their societies. "They feel safe because the perpetrators are typically concentrated (few in number) and highly motivated by the prospect of reaping big, certain, and immediate profits, while the losses are spread over large numbers of individuals." 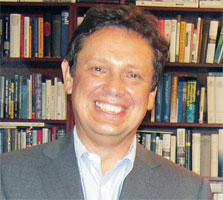 FRANK SCHIRRMACHER is a German journalist, essayist, writer, and since 1994 co-publisher of the leading national German newspaper Frankfurter Allgemeine Zeitung (FAZ). He is one of Germany's leading journalists. Our confidence in the world is shattered. How could what is happening be allowed to happen? Who will we have become once this is over? Why do societies and institutions—to pose the question once raised by Leopold von Ranke—have ruin right before their eyes and yet march straight into it? This is the question that the American House of Representatives considered at the start of this past week in its hearing on the Lehman Brothers bankruptcy. How could the managers of the bank still carry on as though nothing had happened although they had known for months that their business model would go bust? The answer is: Lehman believed that a breakdown would also hit the others and affect so many people that the government would have to intervene. We are just being taught to call this conduct "greed". But "greed" is the most innocuous explanation of all for this acute threat to our social order. That is perhaps why people like to use it so much. During the past two weeks the old mortal sin was invoked in more than three thousand press articles; in the meantime, judging by the headline of a German business paper, we have now reached the point of discussing the "greed of ordinary people". Greed may be bad, but it is human. From that point of view, the present crisis would be nothing more than a routine appointment in God's standing tribunal on man. Societies were civilized to prevent precisely what now seems possible: that they are destroyed by the reckless action of individuals. If this safeguard is no longer guaranteed, profound distrust in society and in the dependability of social reason begins. That is the situation politics now finds itself in. But because millions of Germans were urged over the past decade to convert to neoliberalism, trust the financial markets and distrust government that is now everybody's situation. Everyone now has to face up to the fact that the reasoning behind their most important life decisions was based on a purely speculative system. This precisely is the wager that Congress identified at Lehman Brothers. In the mid-sized loss zone, writes Diamond, individuals waive legal recourse because they see not the slightest chance of receiving compensation, given the large numbers affected. In the big loss zone everybody is affected, and now the already damaged state is practically compelled to take action to stabilize the system, even if that leads it to the brink of disaster. According to Diamond, the inclination of elites to ruin a society grows in proportion to their ability to insulate themselves economically from society as a whole. The better they manage to do so, the less will they be affected by the consequences borne by everyone else. Those who believe that the current destruction of fundamental trust in the rationality of economic action will remain without consequence will know better at the latest after the next election. The world of money has been fictionalized over night. The escape into nationalization, initiated by the banks themselves, is the liquidation of market metaphysics. Now that we live in utter uncertainty about what is and what is not, only the state remains to pronounce that something does indeed exist, and not just nothing. If Friedrich Engels' observation: "The essence of the state is humanity's fear of itself", ever applied, it does so today. The chancellor was right when she spoke of a threat to our social order in her policy statement. The bank failures on Wall Street have unleashed a chain reaction comparable to the impact the 18th century Lisbon Earthquake had on the thinkers of the enlightenment. Then, the question was how a benevolent God could permit such a catastrophe. The consequences were: doubt in the viability of his world and a process of self-enlightenment that left virtually no stone unturned in the European system of thought. How could what has just happened be permitted to happen? If answering that question is not to be left to left-wing demagogy, it will be necessary to talk about the division of our society into those who bear the consequences and those who do not or even benefit from them. Civic society has proven repeatedly that it can learn from paradigmatic disasters. Now, in the latest situation akin to global civil war, it must enter into a most vigorous argument with itself. The crisis not only changes the world. It changes the way we think.